Recently I’ve been looking at a series of NSW naturalisation certificates held in the National Archives of Australia here in Canberra (NAA: A806). The naturalisation certificates in A806 are ones that were ‘cancelled’ by Customs officers after apparently being used by Chinese to attempt fraudulent entry to New South Wales. 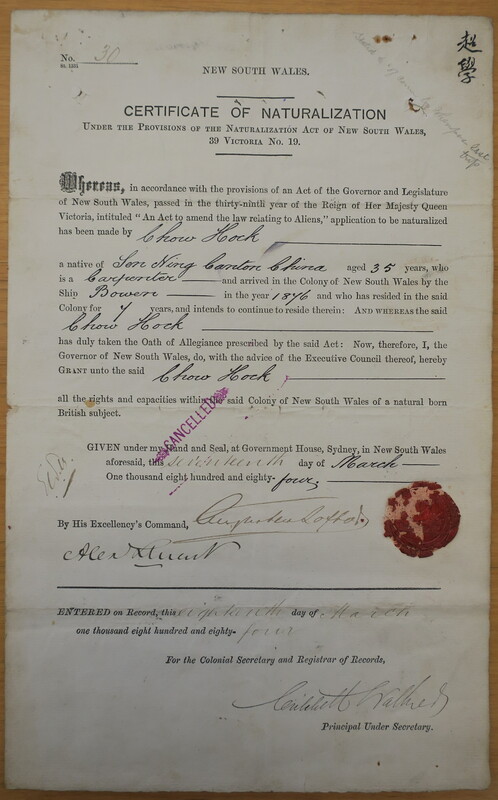 In the 1880s and 1890s Chinese who were naturalised British subjects in NSW were exempt from paying the poll tax on entering the colony (£10 after 1881, and £100 after 1888). After the turn of the 20th century, naturalised Chinese used their certificates to prove their Australian domicile and avoid having to sit the Dictation Test on return from overseas. As a consequence, a trade in naturalisation certificates grew up within the Chinese community, as certificates were sold or passed on to others to use after a man had died or gone home to China for good. Some of the naturalisation certificates in A806 have layers of hand-written notes on them, most of which are undated, which suggest the same certificates were used several times as re-entry documents – perhaps initially by the legitimate holder of the certificate and subsequently by someone else. A number have ‘£10’ written on the front, suggesting that the Chinese passenger was rejected and made to pay the poll tax to enter the colony. Some have Chinese notations (mostly on the back), giving personal details such as name, age, place of origin and length of time in New South Wales. A806 comprises three boxes and several hundred certificates, which I’ve photographed and am now working my way through in more detail. Eventually I will marry these certificates with other naturalisation records held in State Records NSW and also in immigration case files in the National Archives. In some of the immigration cases involving naturalisation certificates I’ve looked at, including those in A806, it’s not altogether clear whether fraud was really being attempted or whether Customs officers were just being super cautious in the execution of their duties. With one certificate in A806, though, the fraud was obvious – and it wasn’t the Customs officers who were duped. 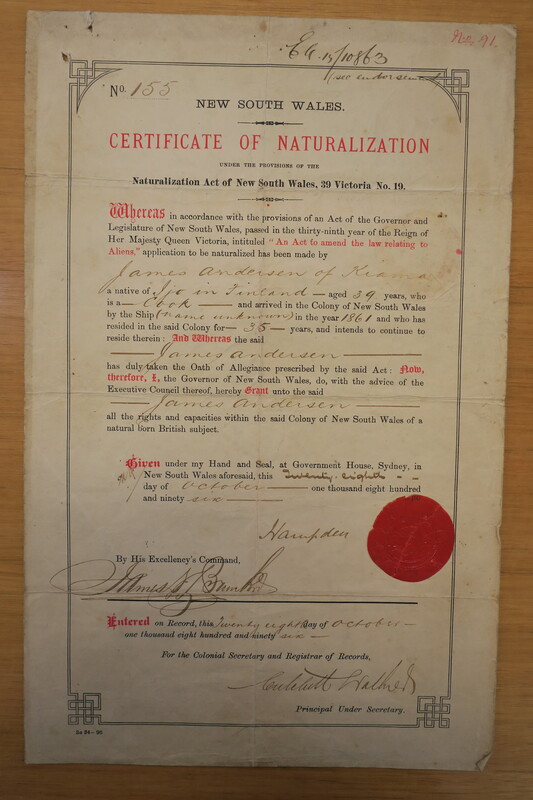 In June 1915, a Chinese man arriving in Sydney on the Eastern from Hong Kong presented an 1896 naturalisation certificate belonging to ‘James Andersen of Kiama, a native of Finland’. The unfortunate fellow, who presumably didn’t read much English, was returned to Hong Kong on the same vessel.